Rebecca Davis has a long relationship with material. Her dancers have worn shoes wrapped in newspaper, leaving smudges of black ink on white paper. They’ve sported unraveling sweaters, the trailing yarn making a sculptural design. She’s covered walls of a theater in security envelopes from floor to ceiling. In the final hands count beginning sounds, Davis moves on to a new source. The body itself is now her canvas, her material. The intimate quartet folds their joints like origami, spoking their arms at sharp angles and lying supine stiff as boards. 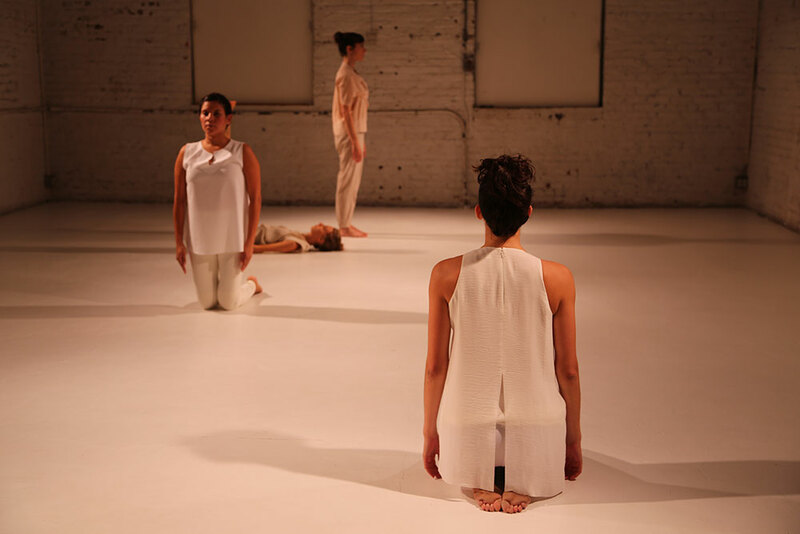 At first glance, the work evokes the late Trisha Brown’s Group Primary Accumulation, although, instead of resting side-by-side equidistance from one another, they’re offset. The dancers often move in pairs, mirroring their counterpart. As a unit, they bloom and shrink like a kaleidoscope. Sometimes these simultaneous duets result in an arresting low-lying tableau where a dancer’s forearm bisects another’s torso, the crest of a hip peaks around someone else’s shoulder. Their four bodies, which moments before were singular beings, now coalesce into one, like a Rorschach image. What is it about a geometric dance that is so damn satisfying? It’s certainly not because it’s a new concept. Merce Cunningham explored rigorous shapes and designs in his work, and the Judson Church-era choreographers found beauty in the geometry of everyday movement. In today’s choreography, this exploration can come off as derivative or calcifying. But what sets Davis’ work apart from minimalism dujour is its energetic hum. Even in the minutes where the dancers lie still in complete silence, they radiate propulsion like flowers about to bloom. Observing the dance is akin to taking in an Agnes Martin line painting. From a distance, it’s all precision and symmetrical symbols. But swimming underneath the stark simplicity are subtle shifts in tone. Kathy Kaufmann’s lighting palate of pastels reveals these teeming changes. A celestial feeling creeps to the surface as Carolyn Hall stands under a warm yellow glow, her profile basking in sunlight. The formal structure erodes when Dana Florin-Weiss smacks her hand to the ground. Fingers tap the floor in syncopated impatience. The recorded voice of a child begins a monologue, “I am from the future. . . In the year 3031, the human race will achieve intergalactic space travel.” This child shares that Davis presented a work in the Chocolate Factory’s inaugural 2005 season, a dance that “has a strict time structure, like a grid.” Now the choreographer is here again in the venue’s final season before it relocates to a larger space. This biographical cosmos insert is peculiar, but nonetheless poignant. the final hands count beginning sounds throws the concept of time into relief, reminding us that we continue to change and evolve even in the most imperceptible moments to eventually come full circle. Written by Trina Mannino for The Dance Enthusiast.